December 3, 2015 by Emily Brees Leave a Comment - This post may contain affiliate links. We had quite a surprise this Thanksgiving. It sure will be one to remember. I like to think of it as our “Lady & the Tramp” Thanksgiving. It’s right up there with the time that Buck, my childhood dog, ate all the mostaciolli before we ate our Christmas meal. 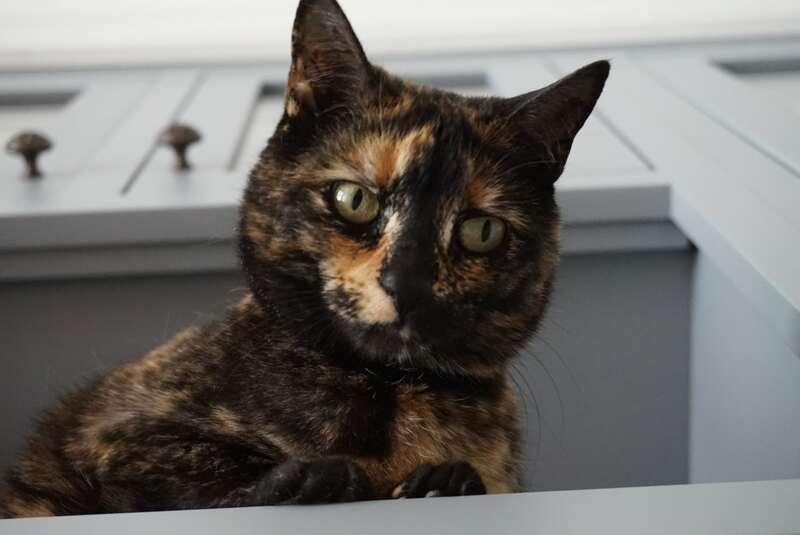 This is Della – a dexterous cat with some fine combat skills. She looks innocent, right? Well, the story begins with a beautiful free-range, organic turkey, purchased from a local farm and cooked to perfection on Thanksgiving day. Now, we all expect leftovers, right? Not this year. We did carve and wrap up the leftover turkey. I decided to store it in the basement beverage refrigerator. There was no room upstairs and we often use the downstairs fridge when we have guests. Well, the very next day my mom was looking forward to her turkey sandwich – which she says is her favorite part of the Thanksgiving meal. I went downstairs to grab the leftovers for her and about halfway down the steps I stopped dead in my tracks. Off in my left peripheral vision I detected something out of sorts. A fridge slightly ajar. A giant turkey leg bone in plain sight – cleaned with precision. My first though was Della. You see, she spends a lot of time in the basement when guests are in town. It takes her days to warm up to strangers. Plus, she’s excellent at opening drawers, cabinets, doors, etc. Not a big deal, right? So she ate a piece. Surely there would be plenty left untainted. I continue down the stairs. One step, two step, and then stop dead. Again. At the base of the steps on a 2 x 3 rug lies a dead RAT. I was horrified and our turkey leftovers were officially declared inedible. We will never know how the fridge was opened – Della or the rat. Perhaps it popped open a bit after I closed it and I didn’t notice. Either way, Della (aka Tramp) had saved us from the evil rat and we have a Thanksgiving story to remember. Anyone else have a Thanksgiving blunder to share? Holiday stories are always the best! 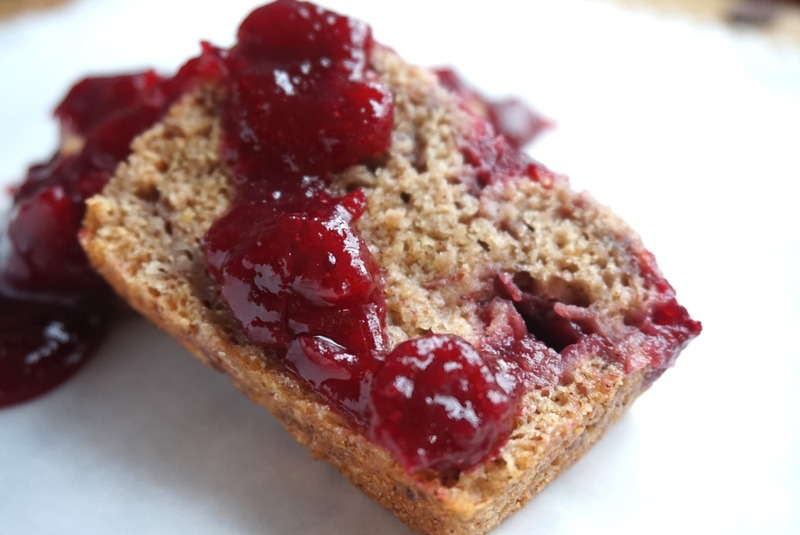 In the meantime, with no turkey to spare, I offer up my leftover Cranberry Sauce Sticky Bread (with a secret ingredient) as well as my recipe for Cranberry Pomegranate Sauce. 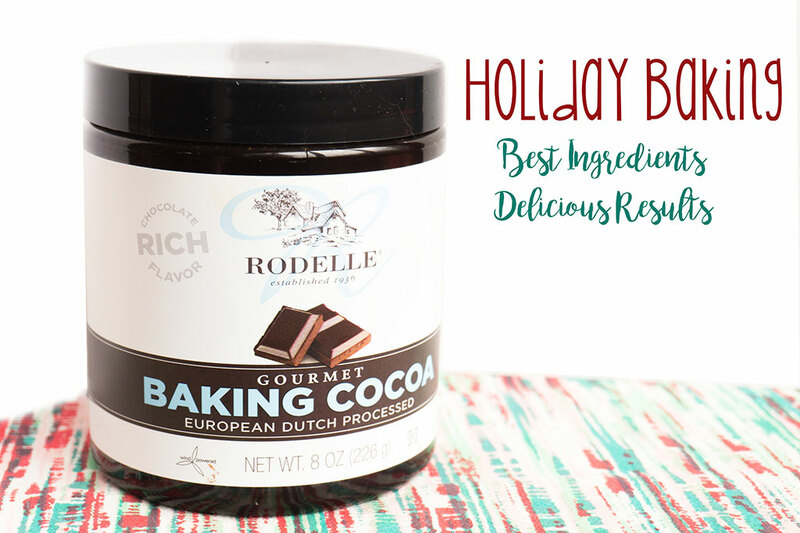 It may not be a turkey sandwich, but it’s a great way to get a leg up on Christmas baking. Get it…leg…ha ha. 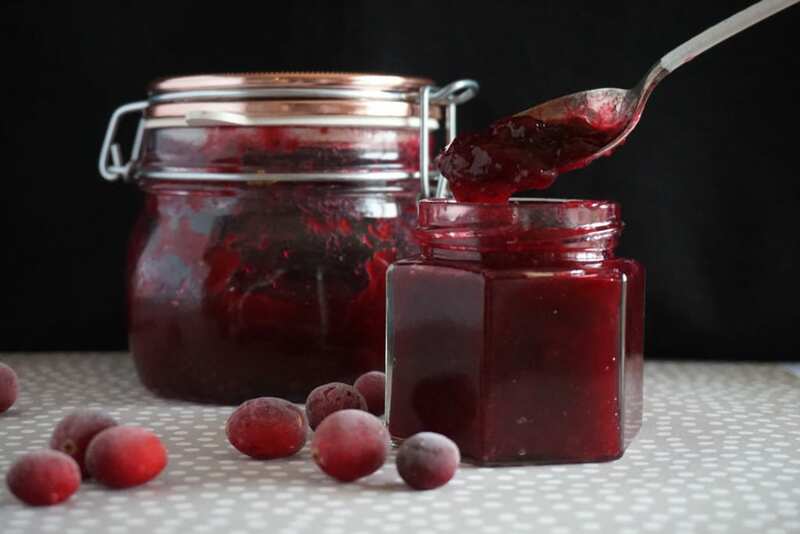 An easy cranberry pomegranate sauce for your Thanksgiving dinner! Bring cranberries, pomegranate juice, water, brown sugar, and orange zest to a boil in a medium saucepan. Reduce heat and partially cover. Simmer until the majority of the cranberries have popped - about 20 minutes, stirring occasionally. Remove from heat and mash with a potato masher. Taste & add more brown sugar, 1 tsp at a time, if desired. 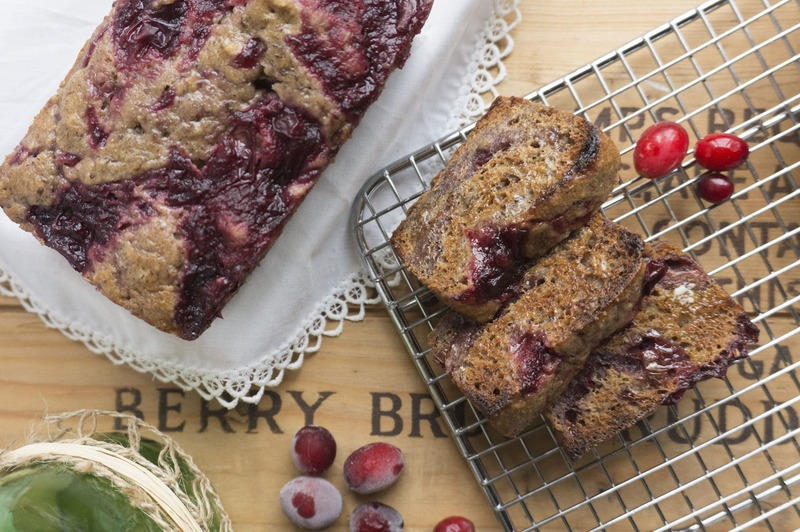 Use extra for the quick bread recipe below! May be prepared up to 5 days in advance. Store in a airtight container in the refrigerator. Combine the ground flax and water in a small bowl to create your flax eggs; set aside for about 15 minutes until the water and flax create an egg-like mixture. Add the flours, cinnamon, baking soda, and salt to a medium mixing bowl. Whisk to combine. In another medium mixing bowl, whisk the coconut milk into the sugar until creamed. Add the applesauce, mix into the sugar mixture. Stir in the flax eggs and extract, then pour the wet ingredients into the dry ingredients and stir until just combined. Fold in 2/3 of the cranberry sauce so that it creates ribbons of cranberry. Spray 3 mini loaf pans (3 x 5.75 inches) with oil. Divide the mixture into the pans. Take the remaining 1/3 of cranberry sauce and scatter dollops of sauce across the top of each bread. Bake for 35-40 minutes, or until a toothpick inserted into the center of the bread comes out clean. This bread is super moist. I love to slice it for breakfast, put it under the broiler for a few minutes and add a little butter. Crispy top + moist interior = yum! 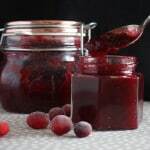 *if your cranberry sauce is watery, either strain it or reduce other liquid in the recipe.